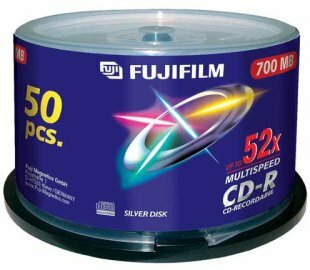 Fujifilm P10DCRCA15A 80min 700MB CD-R (50 Disc Spindle). Fujifilm recordable compact discs (CD-R) are ideal for production, post-production, and studio professionals who require a reliable, yet inexpensive way to store and archive read-only data files. Fujifilm recordable CD-R discs offer wide drive compatibility for superior recording performance with all currently available computer and studio equipment, and make a perfect distribution medium for radio spots, air-checks, and other low volume distribution needs.